After the split up of the original band things get somewhat confused. For a short time Jeff and Jim carried on as The Exiles, bringing in John French on drums and Don Geisen to help out on guitar. The rare photo below shows this line-up - Jim, Don, John and Jeff. But at some point they changed their name to The Illusions (or Allusions). 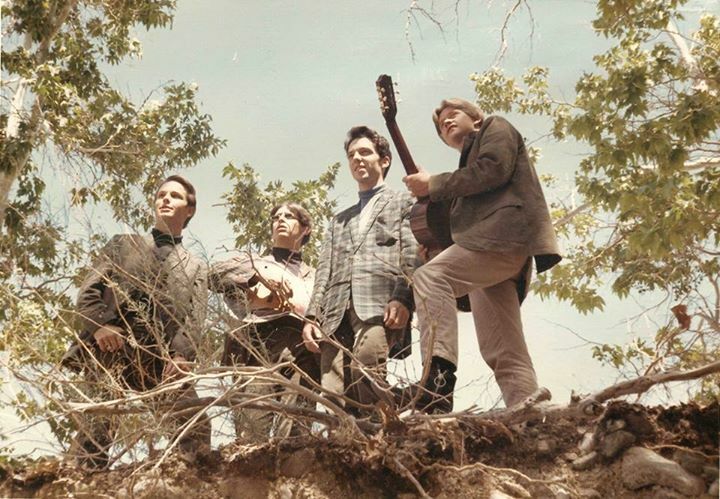 John and Jim had left to join Merrell who had put together another version of The Exiles in early 1966 and was recording with them. This time the band also included Mark Thompson on keyboards. However, this line-up was soon to change to include Mark Thompson again on keyboards plus two future members of Mu, Larry Willey on bass, and Randy Wimer on drums, who went on to record a single credited to Merrell and The Xiles. Gary Lotspeich remembers Jeff's band performing, probably as The Illusions (or Allusions), at his final high school prom. Their setlist included a number of Buffalo Springfield songs which Gary recalls as being very cool for the time. 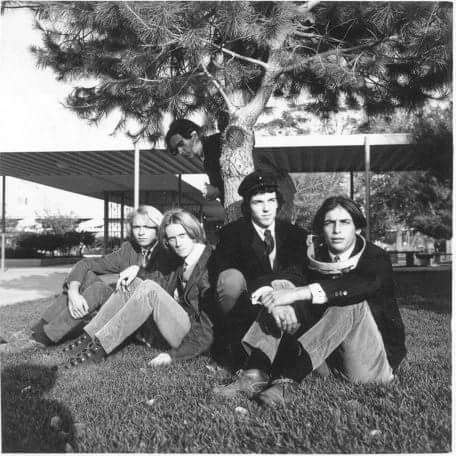 The membership of these bands seems to have been continually changing with people playing or sitting in with several bands at the same time and it wasn't long before Jeff teamed up with John French in a band called 'Blues In A Bottle'. Playing mainly blues covers in a similar vein to the early Magic Band, John handled the vocals and played harmonica, Jeff was the main guitar player, Jeff Parker (who would later figure in Mu) joined on second guitar, Mark Boston (yes, aka Rockette Morton) was on bass and Don Giesen played drums. This band, which according to John French had a "big Yardbirds-like sound", played some live gigs, including upstaging Beefheart when opening for him at a local concert, but, sadly, was never recorded. 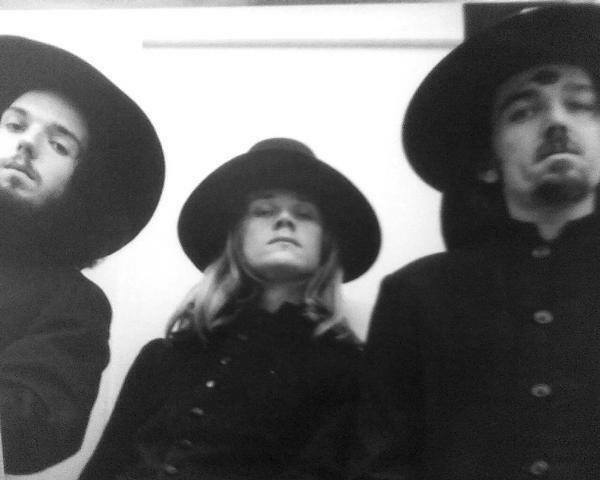 "Jeff and I hung out a lot before we were both in the Beefheart band ... well actually John French, Jeff, Mark [Boston] and I did 'cause we were like the local little teenage hotshots who one by one ended up in the band ... but Jeff and I hung around a lot ..."
Then John got the call to replace P.G. Blakely in the Magic Band. Jeff carried on with 'Blues In A Bottle', probably with Bill Harkleroad as a replacement. John French said he recalls seeing them at "...an afternoon outdoor party ... Jeff sounded great"
Jeff would certainly have been aware of what the Magic Band were doing, they were after all the hottest band in Lancaster and he knew the drummer, and almost definitely would have heard the SAM album when it appeared in September 1967. This awareness and his own ability as a guitarist and interest in blues playing would have stood him in good stead for the job as second guitarist to Alex St Claire. DVV was certainly aware of him, he'd have heard him play with The Exiles and then with 'Blues in a Bottle' and his abilities had been extolled by John French (now in The Magic Band) and Don Aldridge (who hung out regularly with Don and at Magic Band rehearsals)..
For a while DVV had the idea to use Jeff as lead guitarist in a band he was planning with vocalist Don Aldridge to be called '25th Century Quaker'. Don Aldridge was another Lancaster musician who, at the time, was working with Merrell Fankhauser and Gary Lotspiech in a band called Aldridge, Fankhauser & Lotspiech (some of their recorded work can be heard on the 'Fapardokly' album). The '25th Century Quaker' project was supposedly to be kept under wraps but Jeff inadvertently mentioned the possibility to Merrell who was not best pleased and ended the AF&L band. And in the end the 'Quaker' idea was dropped too, probably because DVV decided to continue with the Magic Band and saw Jeff as a potential successor to Alex St Claire with the added bonus of being younger so he would be easier to manipulate. Photograph: Thanks to John French for permission to use the pictures of The Exiles and of Blues In A Bottle.